Well November 1st was a big day for those in the Microsoft Dynamics community, a day that some have waited a long time for. November the 1st saw the first iteration and release of Microsoft’s new Dynamics 365. As a product solution provider and ISV the team at MyCRM first had “Oh, what does this mean” moment back in June and then cracked on and rose to the challenge to deliver integrated products as before. With every release of Microsoft Dynamics the MyCRM team review and release updated versions of its popular product like ePDF, ePlanner etc. While the popularity of Microsoft solutions increase the MyCRM team continues to reinvent processes and deliver out the box solutions that increase productivity for end uses. As an ISV, MyCRM have been building applications and solutions for Microsoft Dynamics since the release of CRM v4.0 in December 2007. In 2010 we took a decision to build and offer a download site for our Microsoft extension so that our customers could buy add on solutions directly from our web site. As you might say the rest is history and we now have 15 products that can be used via our brand new download platform. We have a range of new products and subscription coming through 2016 and 2017 all compatible with Dynamics 365. One of our popular solutions ePlanner has recently been updated to support better user security and additional view and navigation features to the left. EPlanner helps with resource planning across the enterprise meaning that everyone that is either in a team or that can see users will have the option to see related activity. The planning solution comes with server views including a 3 month view giving a snap shot of different activity. The easy to use drag and drop interface makes planning and updates a straight forward task for end users. ePlanner also supports custom entities that are activity types meaning if you wanted to store Holiday and Sickness records in CRM you could quick do this with a customer activity type. ePlanner offers organisation and end users even more functionality above that of additional bolt on calendars for Microsoft Dynamics CRM. With ePlanner you also now have the option to create views for a record type that have sub activities so for example if you have a Project with activity line items you could quickly display them on the planner, planning the resource as needs be. Since the launch of v4 of CRM the team at MyCRM have had a version of ePDF, a sophisticated but easy to use addition that enable quick and easy output of record content in a PDF format or as an email with the same PDF attached as a file. In the latest a release due mid-November the ePDF solution has been extended even further. 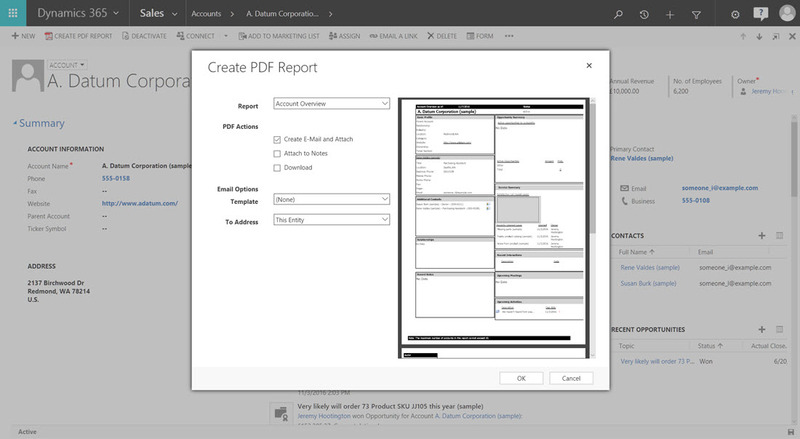 This time the team have added the ability to run the ePDF solution against multiple records and even download the prepared PDF files as a zip file. Lead generation though the addition of Maps. Adding maps for lead generation for your sales team or users is a great add on win, the reason the eMap from MyCRM is so popular is that it open an interface to 66 million business records by location. So if you wanted to search a local are near one of your accounts of contacts to find related or similar businesses now you can. eMap with Microsoft Dynamics can empower users as by default all standard map features are provided. eMap provides the ability to navigate between multiple maps and these can easily be created along with multiple layers of data on each of the Maps. A related blog bost on maps can be found below. Suppliers are just as important as customers. Why would you not want to record your spend with your supplies in the same way that you record revenue from your customer, with the addition of MyCRM ePurchasing, you can quickly and easily record purchase orders and products ordered by each supplier. ePurchasing also has a built in approval process, the ability track budgets and nominal codes or cost centres. The ePurchasing solution also has a number of bundled products from the MyCRM product range including eTax, ePDF and eNumber but the bundled version will only work with the purchasing module to make it easier to follow an end to end process of creating and sending purchase orders to suppliers. 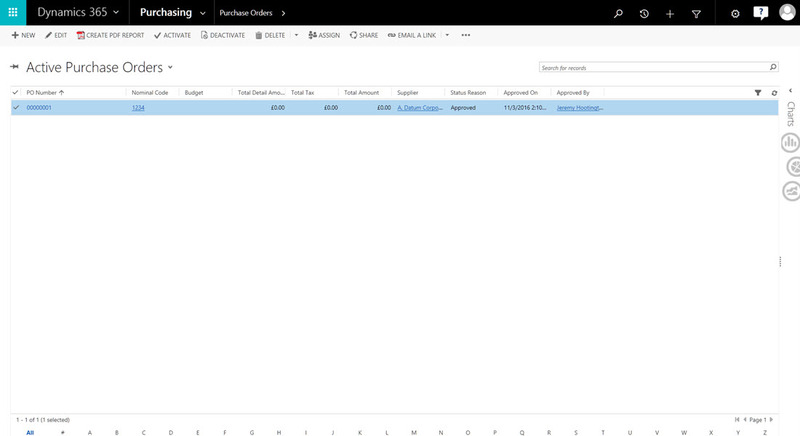 You can see a related blog post here http://blog.mycrmgroup.com/post/2015/12/15/understanding-and-managing-budget-spend-with-suppliers-in-microsoft-dynamics-crm to help get the best from our purchasing module. We've got some really exciting news!